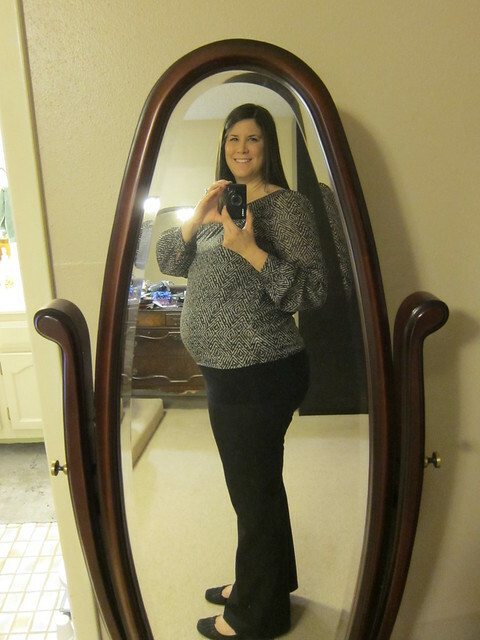 How far along: 28 Weeks. Now in the 3rd trimester with only 12 weeks left! How big is baby: From Baby Center - baby weighs two and a quarter pounds (the size of an eggplant from The Bump) and measures 14.8 inches from the top of his head to his heels. He can blink his eyes, which now sport lashes. With his eyesight developing, he may be able to see the light that filters in through your womb. He's also developing billions of neurons in his brain and adding more body fat in preparation for life in the outside world. Weight gain/loss: I forgot to weigh myself this week so no update. Sleep: Still sleeping great but finding that I'm getting up to go to the bathroom once again during the night. I'm going to miss sleeping through the night. Movement: lots of movement still. He found my hip bone and my ribs and is not a fan of either. Ow. Symptoms: Nothing new in this area. Best moment of the week: Having our floors finished! We can now get stuff back in their places and not in the sun room. We're still battling a nonfunctioning AC unit which is miserable. How I'm feeling: Pretty good. I feel like I'm about to have another growth spurt though so we'll see. Tap Tap Tap. This thing still on? Well hello there! looking for something not pregnancy related? This post is sorta it I guess. Basically it's a what's been keeping me so dang busy post. I've officially entered survival mode. Work is at it's absolute peak. If I can make it through these next two weeks I should be good. It's going to be absolutely crazy, but will hopefully soon be over. It just means nonstop work and many late nights. Work has officially become the cause of the nonpregnancy related chunk of my exhaustion. Of course the other third is made up from stuff going on at the house. Oh, you mean I haven't mentioned that we're redoing about 900 square feet of flooring, ripping out the baseboards, and painting two rooms? That is SO going on at our house currently. Basically my entire house aside from our bedroom and the living room are currently in the sun room. Even the fridge is out there. It's been interesting to say the least. We are finally having the floors installed this weekend though so it'll all be over soon. Really I should be giving John the majority of the credit for the house stuff. He's been the one ripping up the carpet, baseboards, painting, and doing most of the heavy lifting. I move the small stuff, try to sweep, and otherwise keep him fed and in a good mood while he's working. Survival mode y'all. Nothing like tearing up your whole house while pregnant and during the busiest time of year at work right? So that's what's been keeping me occupied lately. As soon as I don't feel like taking a nap right when I get home, I'll have more time to dedicate to this poor neglected space. 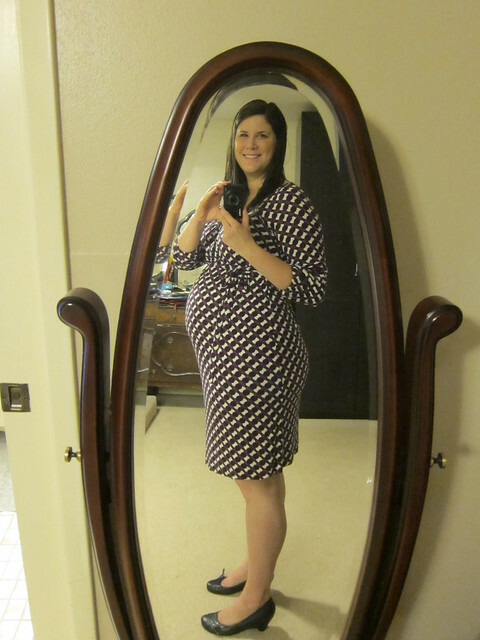 I do good to get a weekly pregnancy update up so please bear with me. I promise I'll have more to say about more things very soon. 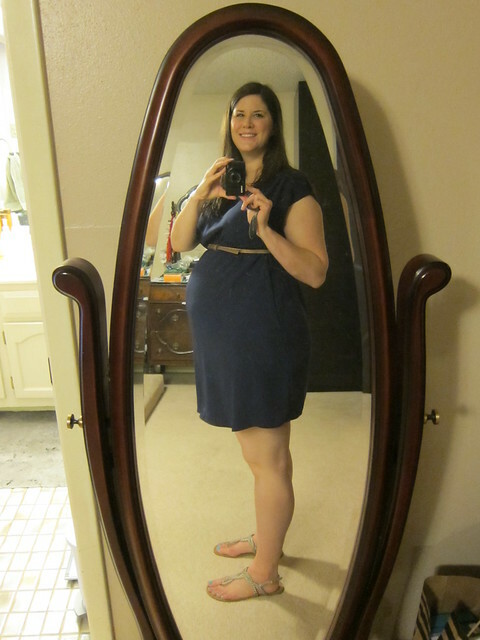 The bump: I actually feel smaller. Baby boy is SO LOW still. I started feeling kicks in my ribs in the past few days so I'm sure he's moving around a bit. Sitting on my bladder feels a lot better the kicks in the ribs though. How big is baby: From Everyday Family - Measuring about 14.5 inches long, he weighs just about 2 pounds. (The size of a rutabaga according to the Bump). This week, his brain is developing quickly. His eyelids, which have remained closed up until this point, begin to open and now his retinas can begin to form. The retina contains specialized photoreceptor cells that respond to light, called rods and cones. Cones in particular help us perceive color. His skin is still wrinkly; but by 27 weeks, he basically looks how he will look when you give birth to him – in just a few months! Weight gain/loss: I'm up 1.5 pounds this week for a total weight gain of 15.8 pounds. Belly button: Still a cavernous hole. I can tell it's getting a little flatter. It kind of caused this weird flat crater in my otherwise round belly. Sleep: I'm sleeping great, but feel like I never get enough no matter how much I sleep. Diet/Cravings/Aversions: Still nothing special. Sweets are still high on the list, but nothing like they used to be. Movement: SO MUCH MOVEMENT. I'm convinced babies start to annoy you now as nature's way of ensuring their survival once they're finally here. All the kicks are his way of verbalizing "mom, mom, mom, mama, mama, mama." Symptoms: Nothing new this week thankfully. What I'm looking forward to: Being done? Is it too early to say that? How I'm feeling: Overall just tired. I'm finding I get winded easier and can get an awful side stitch if I'm walking too fast or too far. Oh and I'm hot. All the time. Hot. I pretty much always have to have a fan on me now. August is going to be miserable. Random things I didn't know/Problems/Questions: No questions or weird stuff, but I do have my glucose test on Thursday this week. Wish me luck! I have a choice of red or orange. Any preference? 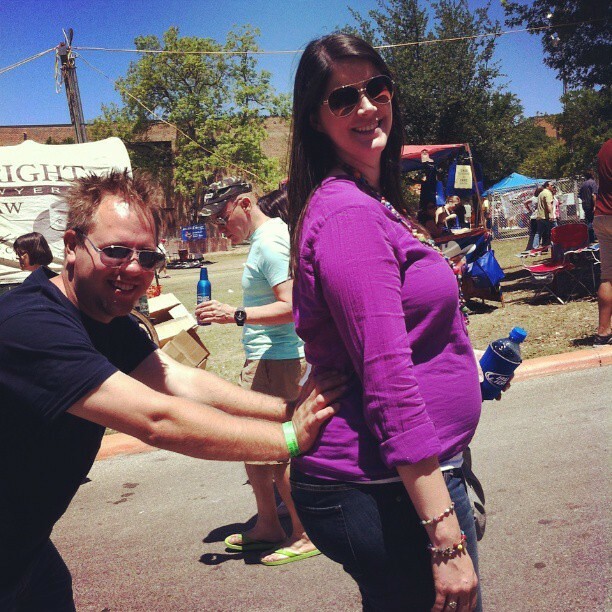 The bump: Frijole is SO LOW. Give my pelvis a break little man! Is it sad that I'd really take a kick in the ribs over how low and heavy he currently is? How big is baby: From The Bump: The size of a head of lettuce! He's still growing in the 13.6- to 14.8-inch and 1.5- to 2.5-pound range, and developing his senses, features and talents! His eyes are forming, and his eyes will soon start to open. His eyelashes are now grown, too. He's getting his immune system ready for life on the outside by soaking up your antibodies. He's taking breaths, too. They're of amniotic fluid, not air, but it's still good practice. Weight gain/loss: I'm down 2 pounds this week for an overall weight gain of 14.3 pounds. Stretch marks: We're up to three now. I'm sure there's a point in which I will just stop counting but these 3 are all front and center. Sleep: Once I'm out I'm out. Thankfully. Diet/Cravings/Aversions: Nothing special going on. Still all the things. Movement: Tons and tons of movement. Sometimes to the point in which it's annoying - yeah, no one ever tells you how annoying it can sometimes get. I think it's really because of how low he is. I'm tired of my lady parts going numb from him trying to kick his way out! Symptoms: Seriously, if there is one I think I'm going to get it. Bloody nose - check! Freckles that become moles - check! Stretch marks - check! Pregnancy mask - check! Cankles - check! Sciatic pain - check! I could go on, but it's getting depressing. 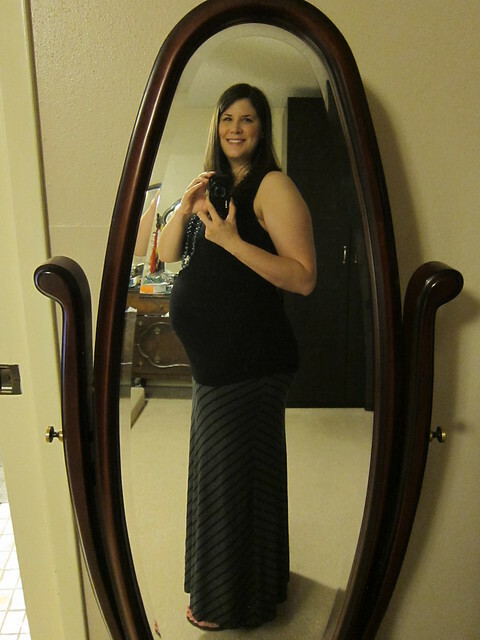 What I'm looking forward to: 3rd trimester - we're almost there! How I'm feeling: In case this post isn't reflecting it, not so hot lately. I've had a few rough days pain wise and it's taking it's toll. I've been moody, hormonal, crying, and just overall not feeling so hot. My back pain has eased up a bit today, but one of my knees still hurts and my old man toe is causing some discomfort. I'm sure it's all because I'm about to go through another expansion and things are just loosening up, but it's still not very fun. Plus this is such a busy and stressful period at work. And if we didn't have enough going on we're tearing up the house to put in new floors. It seriously looks worse than when we moved in. Just about everything aside from our bedroom and one of the living rooms is currently shoved into the sun room. Half my kitchen is currently in my living room even. Can someone just wave a magic wand and have it all be over? I'd kill to just sit down with my feet propped up and eat bonbons all day. If only pregnancy was that glamorous! Disclosure: I have received free tickets to the concert in return for promoting this event. We love the Beatles and great beer at our house so all opinions are my own. 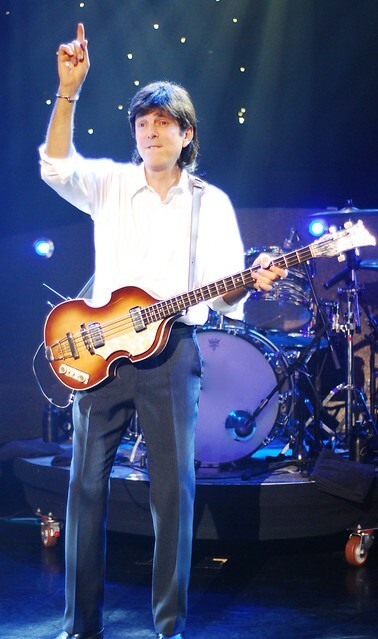 This weekend Beatlemania hits San Antonio. This Friday and Saturday night at the Laurie Auditorium the San Antonio Symphony will present, Live And Let Die—A Symphonic Tribute to the Music of Paul McCartney. Because I know many of you are like me (at least when I'm not pregnant) Club Coda is offering a Double Decker bus ride to the concert on Saturday night. The bus boards at the Stone Oak & Alamo Heights Lion and Rose locations before stopping at the Blanco and 410 location for appetizers and a cash bar. While on the bus enjoy complimentary St. Arnold's beer. Tickets for the bus are $50 and include a ticket to the show. For more information and of course to purchase tickets to the show and for the bus click here. How big is baby: From the Bump - The size of a cauliflower. From Everyday Family - Measuring about 13 inches long, he weighs approximately 1 1/2 lbs. In the coming weeks, your baby will continue to grow and mature at a fast rate, gaining some baby fat and filling out his long, lean frame. As he gains weight, his skin begins to become less wrinkled and he begins to look more, and more like a newborn. Also, his skin is finally gaining some color. His hands are fully developed by this week, fingerprints and all! And at 25 weeks, the structure of the spine is beginning to form. Weight gain/loss: Up 2.3 pounds this week for a total of 16.3 pounds gained. Stretch marks: Lone Sal has 2 friends that are starting to show up. Next week they'll probably be there in full force. Sleep: Eh. I'm definitely starting to feel more tired. I think I'm usually in bed between 9 and 10, but still feel like I could sleep for hours. Sleeping in is a total joke though and I can't ever do it. If I'm not passed out cold then sleep is crap. It's pretty much 50/50 between the too. I did have a night that sleep just totally sucked and Frijole pretty much kicked me all night long. Diet/Cravings/Aversions: Nothing special. I did eat too many sweets and gave myself a stomach ache over the weekend. I can tell that I can't really eat as much as I could once again though. Movement: Lots of kicks now. I even felt some under my ribs the other day. FUN. We also discovered Frijole is a fan of Iron Man. We saw the third installment on Friday and baby boy kicked and moved the whole time. What I'm loving: All the, "oh you just look miserable looks" I'm getting. Yeah. 15 weeks to go people! Symptoms: I'm still getting a bloody nose about once a week or so. I also discovered 3 freckles that have become moles. Yeah. That was a fun thing to learn about! How I'm feeling: Overall pretty good. That's why I think it's hilarious that so many people lately have been giving me the "oh you poor thing" or "any minute now" looks. I'm not huge or anything, and granted I look tired every now and then, but really? I do find that I can get winded a little easier than in the past. It's time to learn my new limits is all. Fiesta came and went this year. We were so busy that we hardly noticed it. In fact, I think this is the first year that I only went to one event. 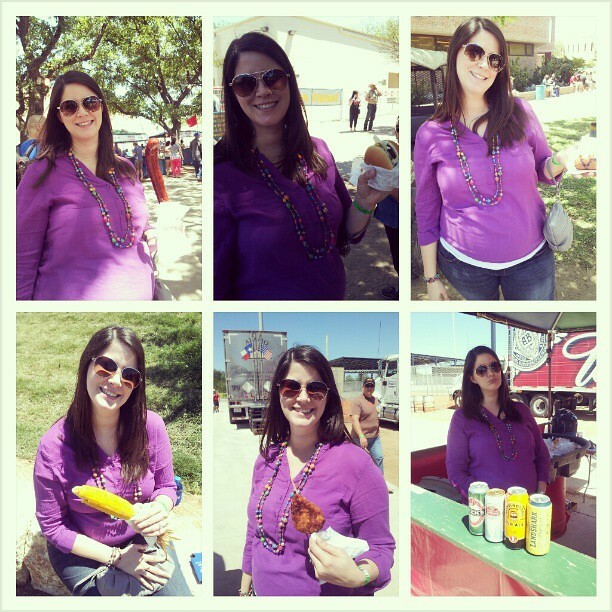 Oyster Bake had to be done and yes, I even worked the beer booth. This year though it was pretty much all about the food. Although somehow John still managed to out eat me! They've changed the set up of Oyster Bake with the addition of a new baseball stadium on the St. Mary's campus. I'm really not a fan as the event has lost it's continuity. Plus the booth we work is now the closest one to the main stage and it's just WAY TOO LOUD. I'm so glad we worked the early shift when just sound checks were going on! We only did one circuit of the event, and just took our time doing it. John thought I could use some help climbing a hill. Afterwards my friend Misty and I decided to go get pedicures. Gotta take care of the cankles! Not our usual way of doing Oyster Bake, but still fun nonetheless!